IGPS North – Garden Visit to Adrian Walsh’s Garden. A report from Jenny Constable. There was a very good turnout of members and guests for our visit to Adrian’s garden. Around forty of us met on a beautiful balmy September evening. The space to the rear of the house is a flat and not especially big but is so well designed and planted as to give a good three dimensional effect. Square and rectangular beds have been set out at right angles and are divided by closely mown grass pathways, a layout which allows the planting to have maximum effect. The garden had several well-chosen trees planted as specimens. 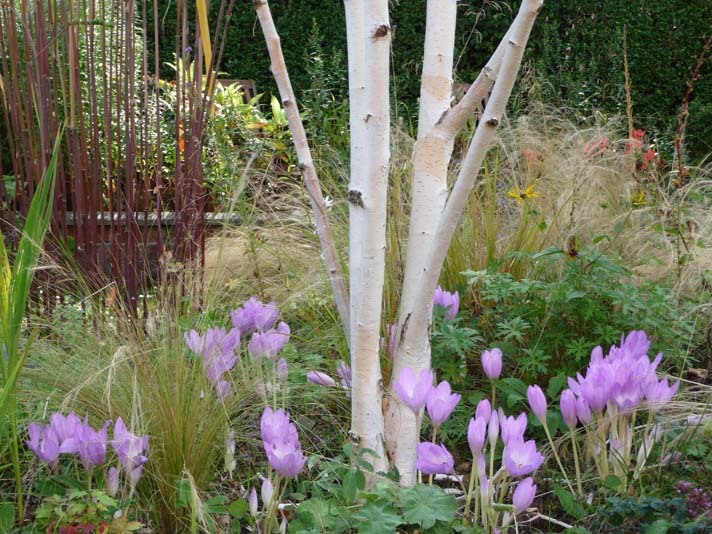 Betula utilis‘Jacquemontii’ , planted just off centre in its bed, took the eye with a carpet of Colchicum underneath to complement the white bark and a lovely Cercidophyllum japonicam, just taking on its autumn colour, showed up well against the lovely blue early evening sky. The many grasses in this area are complimented by plants with purple foliage or flowers, hydrangeas and eupatorium among them. Several bright red dahlias along with the red-flowered Schizostylus major added some splashes of colour while a double-flowered white Anemone japonica added a bright touch to the autumn colours. Everyone seemed to be drawn to the unusual planting in a large oblong container where Stipa ‘ Pony Tails’, Rudbeckia and Verbena bonariensis made an effective Autumn combination. Another feature of this interesting garden is a lovely carved stone which looks centuries old but Adrian explained that it is a piece of sandstone carved by a local artist, the design copied from one of the stones at Bow island in Fermanagh. Adrian spent time with everyone talking about his design and the planting. 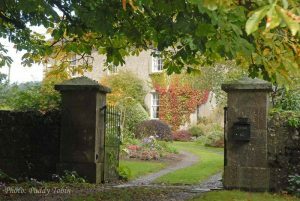 He explained that he was a winner of BBC gardener of the year in 2001 and, judging by his current garden, he was a worthy winner. We are privileged to have had the opportunity to share Adrian’s garden and to learn so much about planting and the use of colour in within a limited space.